People should shovel only so many pounds of oval-shaped chocolate into their faces this time of year. Here are some ideas on how to celebrate the holiday without overworking your pancreas. WASHINGTON — It could be argued that as a good holiday for candy, Easter is second only to Halloween. And yes — even Peeps. The list goes on. It is indeed an extra-wonderful time for candy consumers. One could make a candy omelet with all the ovo-cocoa offerings. But let’s face it: Moderation is tough, and people should shovel only so many pounds of egg-shaped chocolate into their faces this time of year. The internet, bless it, has some great takes on how to celebrate the season without overworking your pancreas. Let’s start with enjoying real eggs instead. Granted, they are not sweet at all. But they are technically 1) oval and 2) eggs. What’s more, they have nutritional value. If you have any eggs left over, you can also go for a sweet take on a holiday breakfast: Easter bunny pancakes. If you don’t like Betty Crocker’s recipe, you can try this recipe. Or this one. Another edible option good for brunch and dinner is the Easter bunny roll, a twist on the baked roll — literally. Another bakeable, huntable option is the Easter egg puzzle cookie. Simply take the multiple pieces of the cookie and put each in a hollow plastic egg. And don’t forget colorful fruit, said Andrea Goergen, bariatric dietitian at MedStar Washington Hospital Center and owner of Cultivate Healthy. Apples, mandarin oranges or red bananas are good options that can be even better when you include nut butter packets. Those plastic eggs (or an origami bunny basket) are quite handy for keeping the candy to a minimum. Just load them up with something more nutritious — or something that is devoid of calories altogether. 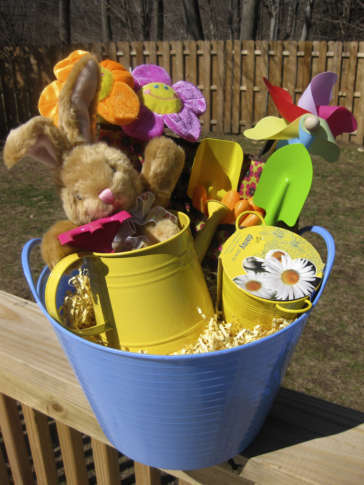 “Putting together a fun Easter basket doesn’t have to be all about edible treats,” Goergen said. “Add fun nonfood items to Easter baskets like plastic eggs with small toys, jewelry, or coins inside; stickers; crayons, coloring books or notebooks; sunglasses and more to keep kids entertained without the cavity-inducing sweets,” she said. Indeed, celebrating this time of year doesn’t require indulging your sweet tooth … or even your appetite. You can indulge your creative side instead. Decorate eggs made of wood or papier-mache. Or make fizzy Easter egg bath bombs, which you can use even after the April showers have given way to July humidity. There are myriad ways that you can get crafty this time of year. And it’s easy to get the entire family involved. Instagram and Pinterest are full of great ideas.